If you want to add shape and definition to your arms, working your triceps is a must. Your triceps muscle at the back of your upper arms consists of three heads -- the lateral head, a long muscle that spans the outer triceps and the medial head, which is a tiny muscle that combines with the much larger long head to compose the inner portion of the triceps. To work your inner triceps, use free-weight movements to effective target this area. Perform close-grip bench presses to develop your inner triceps muscle. Lie on a flat bench. Grasp a barbell with a grip slightly narrower than shoulder width to place emphasis on your inner triceps. Extend your arms to lift the weight. Slowly lower the bar until it touches your chest. Press the bar upward until your arms are fully extended. Do four sets of 10 repetitions. Rest for 60 seconds between sets. Incorporate dumbbell kickbacks into your routine to tone your inner triceps. Kneel on a flat bench with your right knee, using your right hand to support your body. Grasp a dumbbell with your left hand. Bring your upper left arm into the body, keeping it parallel to the floor. Slowly extend your left elbow. Continue movement until your left arm is fully extended. Hold the peak contraction for a moment and proceed to lower the weight until your lower arm is perpendicular to the floor. Do four sets of 15 repetitions to add definition to your inner triceps. Rest for 60 seconds between sets. Target your inner triceps with skull crushers. Lie on a flat bench. Signal your training partner to hand you an EZ curl bar. Grasp the bar with your hands spread about eight inches apart. Extend your arms fully. 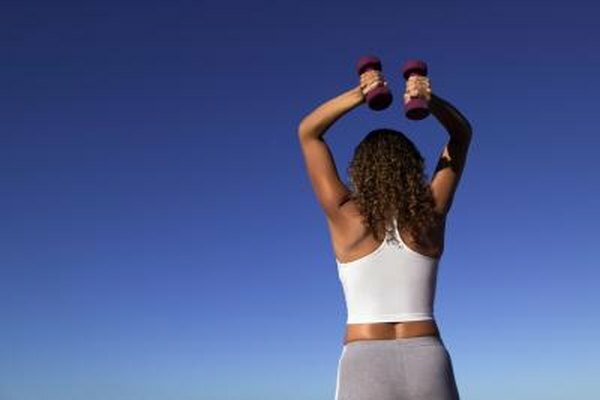 Slowly lower the weight to your forehead, keeping your arms close to your body to place emphasis on the triceps. Keep your upper arms stationary throughout the movement. Press the weight upward by extending your elbows. Do four sets of 10 repetitions, resting 60 seconds between sets. Use a spotter during close grip bench presses to help maintain the proper form and reduce the risk of injury. Train your triceps once per week to rest your arms adequately for future triceps workouts. Warm up with five minutes of light jogging and stretch for five minutes before your workouts to reduce the risk of injury. Consult a physician before starting a resistance-training routine. ExRx.net: Barbell Lying Triceps Extension "Skull Crusher"